This delicate openwork sweater is made from 2ply Shetland lace wool. The stripes of greys and pinks combined with the famous Old Shell pattern makes a timeless and classic sweater. 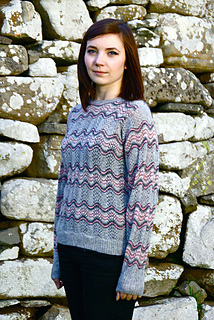 The openwork lace of this design makes it light to wear with the unique characteristics of Shetland wool making it soft and warm.